It has been a long time since I have gotten really and truly soaked while riding a motorcycle. Years in fact. It happened now and then back when I had no rain gear and had to press on in the rain. The topic is also no stranger to these pages (see Rain , Squandering the Attention Budget , and The Rain Machine). But this was different. I have plenty of rain gear. Good stuff, too. I have jacket liners and a full set of Frog Togs and rain covers for the tank bag, and even a set of rain gloves. But on this day, I had none of them. It was a beautiful sunny morning with a few puffy clouds here and there. It was the best part of what was to be a hot and humid summer day. I enjoyed the cooler morning air and the curvy undulating unoccupied country roads. After a while, I stopped to grab coffee. While inside, a trio of joggers came in dripping wet. I went outside to see a glistening parking lot, puddles of water, and a soaking wet bike. This had been no light sprinkle. The rain squall had already moved on, and the sun had never stopped shining. I looked up to see a single light grey cloud amid the azure and cotton ball sky. I checked my weather radar app. Nothing. There were no visible signs of rain in any compass direction. Strange, I thought. I wiped off the seat, shook the remaining water off the soaked tank bag (and put on its’ now unnecessary rain cover), put on my mesh jacket, helmet, gloves, and headed toward home in the opposite direction to the light grey cloud. I was on the lookout for a fast moving grey cloud, but there were none visible. I rounded one of my favorite long sweepers, and a few splats hit the windshield. Big wet splats as if they came from raindrops in some land of the giants out of all proportion to planet earth. Before I could even fully assess my options, there was a torrent of splats. A full downpour while in full sun and with good visibility. The visor fogged, and I was soaked within half a minute. There were no options for shelter anyway, so the choices were to stop and stand in the open to get further soaked, or ride on to get further soaked. I took my mostly wet leather gloves off, and rode on, still looking for the cloud that could produce such a deluge. A minute later, it ended. There was a pretty well-defined line in the road where you emerged from the sunny waterfall and into sunny dry road. No change in sky, no discernible change in temperature, just a Hollywood-like transition. I looked back in disbelief, but there was not much to see. It should have looked like a waterfall, but it didn’t. The whole episode was less than two minutes. Even in warm temperatures, soaking wet clothes are cold. Denim in particular has qualities which allow it to absorb 19.7 times its weight in water, and to simultaneously cool and stiffen. A mesh jacket allows the rain and cold to pass through to the layer against your skin. Brilliant. You try to minimize movement in order to prevent new cold wet areas from touching warm skin. 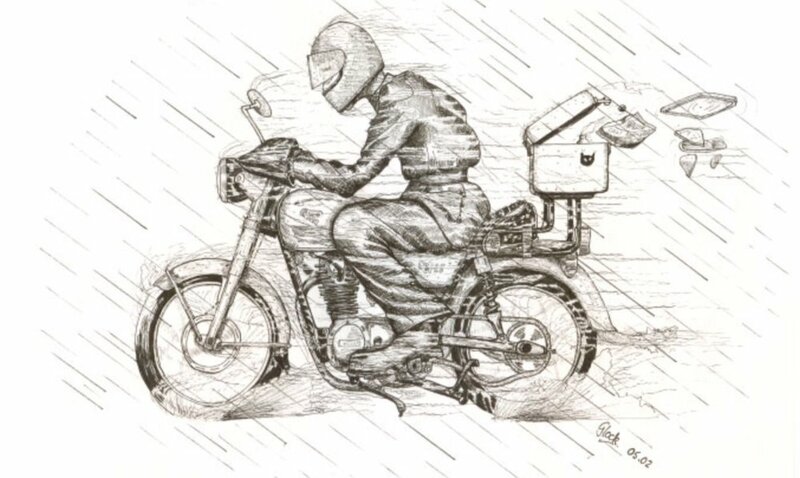 It is futile, particularly on a motorcycle where everything seems to function as a funnel toward the area you would least like to be wet and cold. The fact that it is warm and the air begins to partially dry areas that you are least concerned about being wet and cold, makes it worse. Give me a good solid long-lasting downpour where everything remains soaked. 7.3 miles is a long way in these conditions, but eventually the destination is reached. You slowly climb from the machine as if you are in a full body cast, and quickly liberate yourself from the clothing. 10 minutes later, warm and dry, I looked up at the sky. The same brilliant azure now with fewer white puffy clouds. I consider myself a lifelong learner, and I like to find the lesson in every experience. The toughest part about this soaking is that, try as I might, I could not at first find any lessons to be learned. I was not about to carry full luggage and rain gear for every 1 hour joy ride with no weather indicated. I did not gain some insight about reading a summer sky. I would not change anything on the motorcycle. I finally concluded then, that the lesson was about predictability. Even as a motorcyclist where you accept some elevated level of unpredictability, we like predictability. Despite being somewhat non-conformist, we like rules. Even in a pastime driven by passion, we like logic. The lesson is that certainty only applies a certain percentage of the time. Like many of you who have more than one vehicle to keep track of, the Classic Velocity garage used a combination of paper folders, a whiteboard, some yellow pad pages, and even a spreadsheet at one point. However, as the vehicle count grows, or as time passes, it becomes increasingly difficult and inconvenient to find information by rifling through thick folders. And sometimes, the answer is in a folder that you have since archived or given to the new owner. Even if you only own 1 or 2 vehicles, and do none of your own work, you would probably like to keep track of what was done when, how many miles/hours you traveled, what events you participated in, and be able to recall details and photos anyplace, anytime. The Classic Velocity Vehicle Log (CVVL) is an app that keeps track of all of the activities and costs (at whatever level of detail you choose to track them) over time associated with all of your vehicles. It will even let you go back in time and paint a complete picture of vehicles you already own. It lets you track todo items and deadlines. It lets you It adds even greater value by providing a series of reports on activity, costs, mileage/hours, and locations, to help you easily search and find answers. Reports can be filtered by vehicle, timeframe, type of activity, etc, and viewed in a variety of formats. Lastly it lets you do this wherever and whenever you want on whatever device you want. $10 per year gets you unlimited entries for up to 10 vehicles. Use code CVVLAUNCH at checkout for a discount and help the Log to fund the Blog! August Rabeneick started a manufacturing company near Bielefeld (which was the origin for multiple bicycle and motorcycling manufacturers) in 1930. Initially he produced grinding machines, and then went on to producing bicycles. It did not take very long for him to transition to motorcycles in 1933. Like many others, he transitioned the ability to make steel frames into a motorcycle business using engines from other companies such as Fictel&Sachs and Ilo. The first machines were small displacement at 75cc and 98cc. Post war, that transitioned to 125, 175, and eventually to 250cc two stroke machines. Rabeneick further developed the relationship with Ilo to one that allowed him to brand their engines as his own. 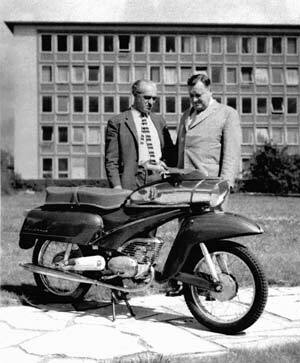 As the 1950s began, Rabeneick also went to smaller 50cc mopeds to make sure that the segment of the market needing very basic and efficient machines wa covered. They also produced a line of scooters which they rebranded as Binetta in the UK (sounds very Italian, si?). Keeping with the theme of rebranding, Rabeneick struck a deal to produce the shaft driven 500cc boxer twin from a company called....wait for it.....Universal, out of Switzerland, as his own. This gave him a complete range of machines from sub 50cc moped to the largest popular displacement at the time. Diversification was an attempt to stave off a declining market. The strategy was good enough to attract the attention of Fichtel&Sachs who then purchased Rabeneick in the late 1950s. 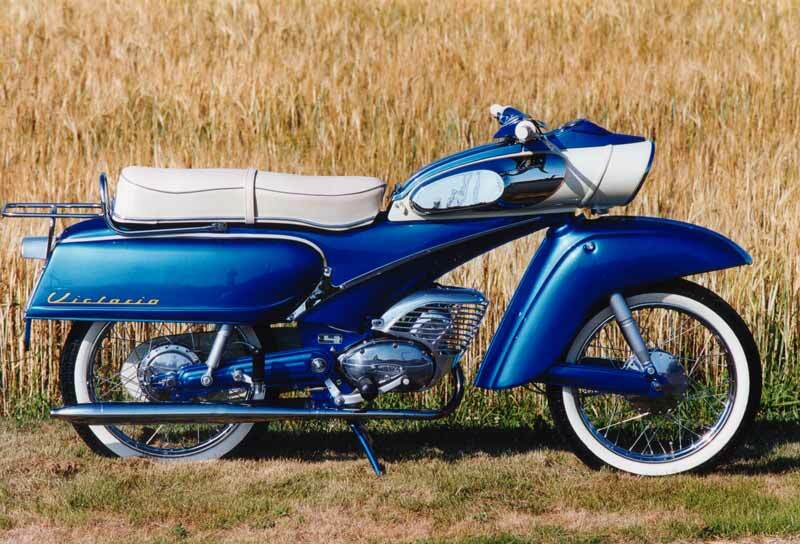 However, the factory eventually closed, and was sold to Hercules, although the brand lived on into the 1960s on a few mopeds. For those of us that believe we need to have a well-equipped electronically-assisted modern touring machine in order to contemplate a cross country trip, Kim Scholer begs to differ. He is taking a 1970 East German 250cc MZ pulling a Czech trailer ! And this is an upgrade compared to his last such trip !! 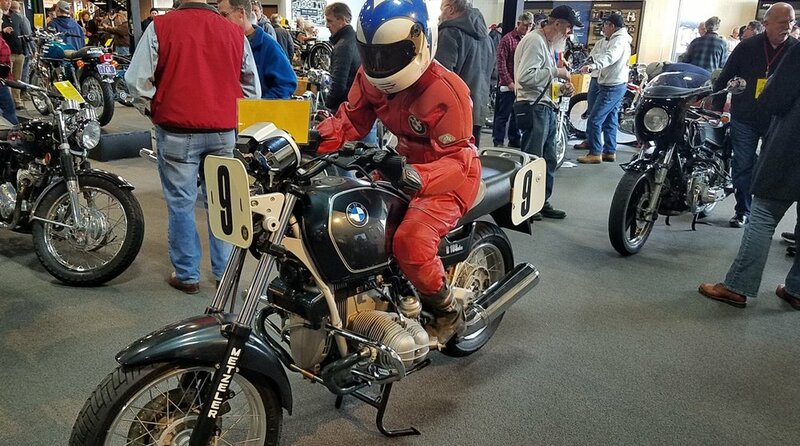 This year, for the first time in many, we missed the Martin Moto Classics show. It always coaxes local, and now with growth, regional owners to bring their classic treasures out to share with the public. There is always an assortment of German machines on hand with BMW featuring prominently, but accompanied by things less common. 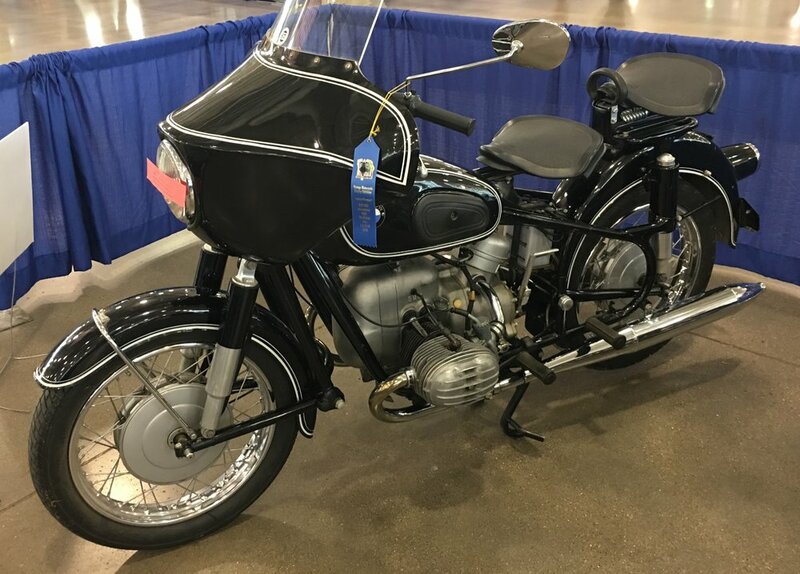 This year, there were nice examples of machines featured in these pages or formerly inhabiting the garage, including MZ, Kreidler, DKW, Condor, and Victoria. I have picked a few machines consistent with the theme of this blog, but thanks to Todd Trumbore and Images from Walter Barlow, you can still enjoy a larger variety of impressive machines via the album link below. Innovation in frames and platforms was the norm in the early days of the internal combustion engine, and many companies were simply trying to find the most efficient means to accomplish a task. One such company was Framo, founded in 1923, the same year as BMW. 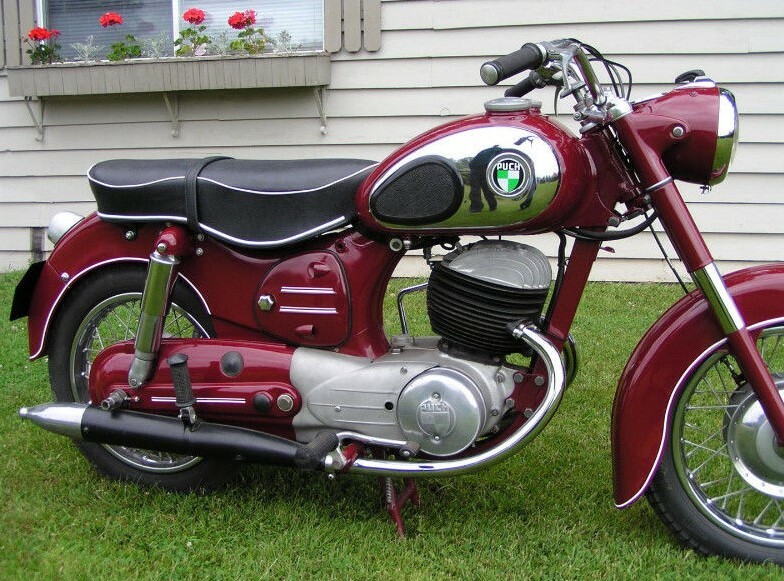 Although founded in Saxony, Germany, it was started by Dane Jorgen Rasmussen, who also founded DKW. 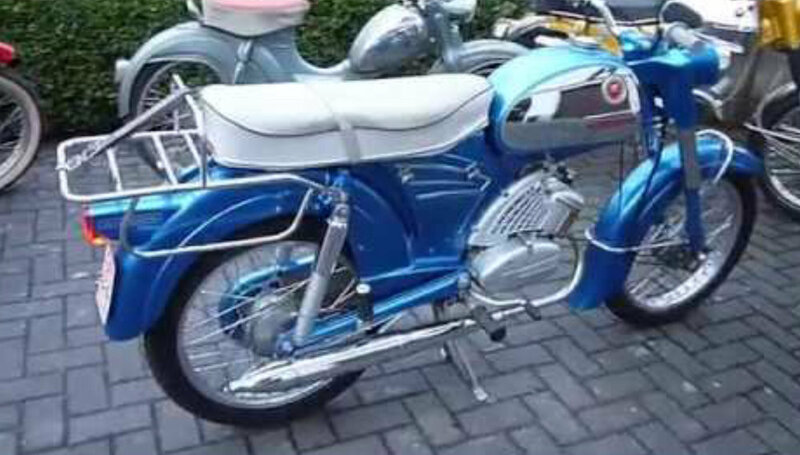 The main idea was to use Framo to produce components for DKW motorcycles. After 3 years, that lead to the production of a commercial motorcycle-based vehicle, Basically, it was a trike with a cargo platform. This TV300 model emerged as a Framo vehicle in 1927. Variations for Framo included a single wheel at the front driven by an engine directly above it, a single wheel at the rear, enclosed cockpits, and open trikes with a covered rear. In other words, many permutations and configurations were tried. Three-wheeled experiments in turn lead to the 4-wheeled Piccolo and Stromer models in the 1930s. 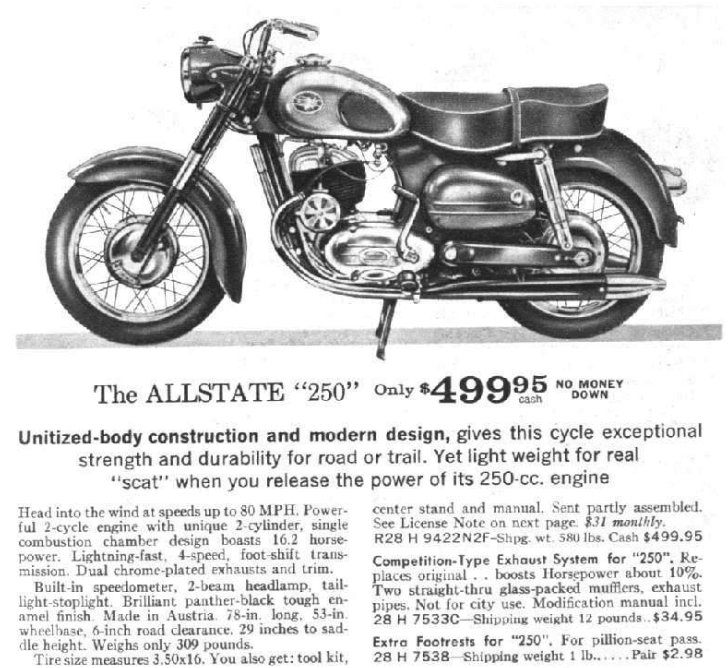 All models were powered by 200cc-600cc 2 stroke motorcycle engines. Sales were simply ok in many instances, and weak in others, with no real sales successes. In visiting museums and collections, I would always be intrigued and amazed by those who were very focused in their acquisitions. Just one marque, or just one model of one marque, or all of the models of one marque for a single year, or all of the yellow Ferraris. These curators have a specific theme or quest, and set out to achieve a focused goal. 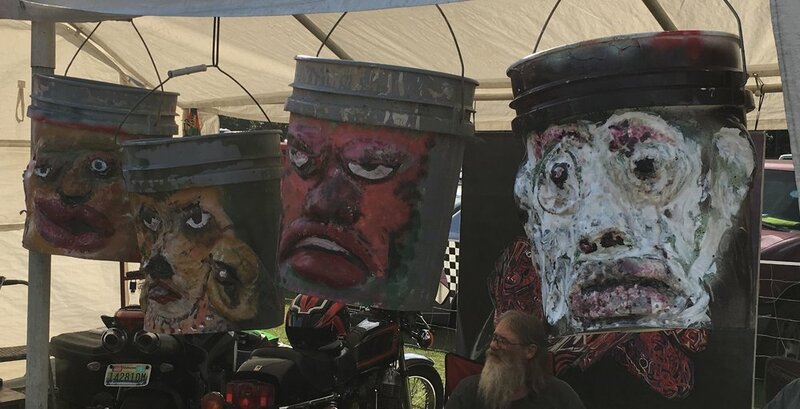 I always thought of these as rather eccentric collectors. I imagined that they were bored with gathering the usual suspects like Gullwings and Vincents. Perhaps they just wanted to outdo a fellow collector by saying "I have every shade of green BMW 2002 ever offered" or "I have every model of the Norton Commando ever offered for sale". This is the "Inch wide and mile deep" approach to contrast the mile wide and inch deep collectors. In a recent conversation, I realized that I am not immune to this tendency. I was speaking with an inch-wide enthusiast friend about the new Goldwing. This is relevant because he has 12 Goldwings (13 if you count the Silverwing). This is impressive just based on the space required, but also based on the dollars. He can spout chapter and verse about the nuances between model years. Three of them are yellow. He even has a model that is widely regarded as bad. It is the mark of a true inch-wide enthusiast, that they even have the bad version of the vehicle. He also has models that the ordinary motorcycle enthusiast would consider to be the same. He has special editions, and first-version-to-have-X models. He knows his Goldwings. And then, he pointed to a couple of my airheads and we had the following conversation. "Those look identical to me. Those are your Goldwings." He was pointing to an R75/6 and an R75/7. "They are not, see the tank on this one and the instrument cluster....." I fell right into the trap and was explaining nuances between the models that only airheads would appreciate, and probably just a subset of them at that. "They are both the same blue." Hhhmmmm, he did have a point there as they were the identical blue. Although, one was far more faded than the other. "Yes, but see the spoke wheels versus the cast wheels, and the switchgear is totally different......." He was smiling now, and I was digging a deep hole. "Was there a big performance jump between these, or some big functional improvement?" He was honestly asking this question, fully expecting to find the rationale for having both. "Well......not really." I did not want to tell him about the few horsepower difference, or the infamous $2000 o-ring. That could easily be considered the bad version. I quickly ran through the years of knowledge and the memorized contents of the Ian Falloon book on Airheads. There was nothing of substance to offer a motorcycle enthusiast not pierced by one of cupid's horizontally opposed arrows. Nothing. "Is one more of a touring model that goes with that fairing?" He was pointing to the color-matched blue Vetter fairing that I had removed, and had no intention of reinstalling on the /6. "Well......not really." He was now fawning bewilderment. "Is either one super rare or collectible then?" His knowledge of BMW Airheads was like my knowledge of Goldwings; an inch wide and a half inch deep. I could easily have lied. "Well this one has fairly low miles, but.........no" He was now implying that I was even worse than him, since I had no redeeming special editions or rarity cachet. "This one says R75 as well. Why would you have multiple versions of the same bike?" It was the /5 toaster tank. Beautiful and so different, but he had scored a knock down blow. Yes, I had gathered all three versions of the R75 over time, quite intentionally. This was a great motor for BMW, and I appreciated the subtle nuances between iterations of this platform from early 1970s to late. It goes even further if you include the R80RT. Yes, I was an inch-wide enthusiast. But when you have no substantive retort in a debate, when you have no defense, you must turn to offense. You must attack a flank where you at least have some advantage. "Oh yeah, well I can park all three of these in the space taken up by one of your behemoth Goldwings!". 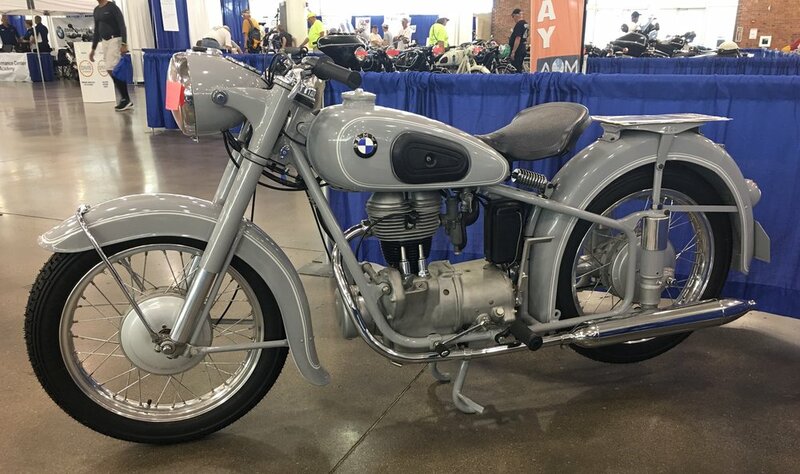 As seen through the eyes of a vintage enthusiast, this annual pilgrimage is a chance to see what is new and trendy, and to lay eyes on what has heretofore been the stuff of articles. 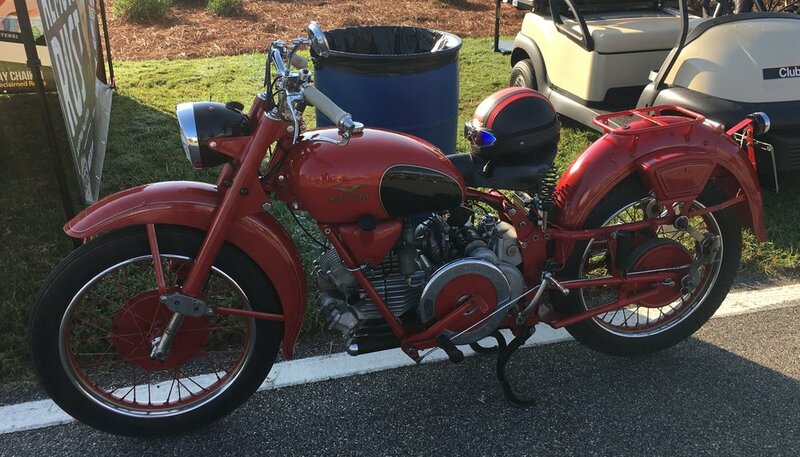 This year, there was an impressive number of “standard” motorcycles. This means relatively upright seating position, handlebars rather than clipons, very little bodywork, no winshield. Among them were the Yamaha MT09 and 07, the MV Agusta Rivale, Kawasaki Z900, BMW RNineT, etc. Nice looking machines that can be versatile as well. Everybody now has an “Adventure” bike, including Royal Enfield with their new Himalayan. Honda and BMW now offer “Baggers”! There is plenty of coverage of the event on major magazine sites, so here is a select sampling of images through the Classic Velocity lens.